You can enter any type of loan scenario and Quicken tells you how much your payments are going to be, how long it is going to take you to pay off a loan, and how much interest you are going to pay. You can print out an amortization schedule showing the detail of all of your payments. This is a wonderful tool and it’s really easy to use. 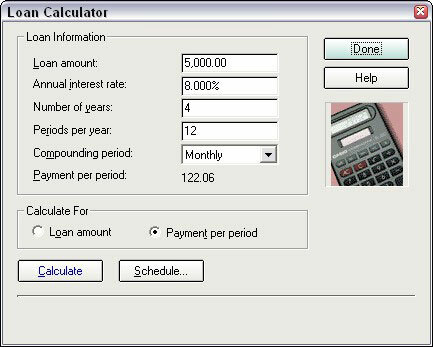 1Go to the Planning menu and choose Financial CalculatorLoan Calculator. 2Decide if you want Quicken to tell you how much you can afford to borrow (Loan Amount) or how much your payments will be (Payment Per Period). Click the appropriate option in the Calculate For area of the Loan Calculator window. 3Fill in the blanks, entering the amount you want to borrow, the interest rate, the number of years and number of payments per year, and how interest is to be compounded. Click the Calculate button to have Quicken recalculate the loan when you make a change in one of the fields. Actually, all you have to do is make your change, and click in any other field, and Quicken automatically recalculates the loan information. 4View the details of your loan by clicking on the Schedule button. 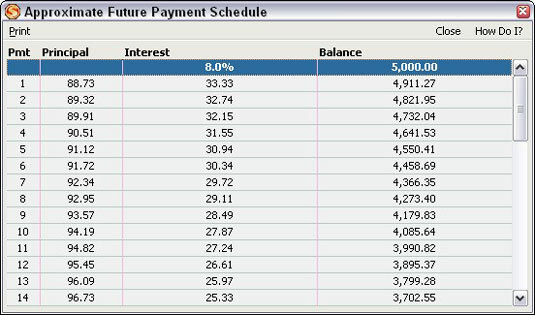 A payment schedule appears, displaying the breakdown of the payments you would make to pay back this hypothetical loan. 5When the payment schedule is displayed, click Print in the top-left corner of the schedule to print a paper copy of the required payments. Quicken’s little payment schedule doesn’t include totals. But it’s an easy task to determine how much the total interest burden is going to be on the loan. For this example, Quicken already told us we’re to pay back $122.06 per month for 48 months. Multiply that payback amount by 48 and you get $5,858.88. Subtract the principal, $5,000, and you’re left with $858.88. That’s how much interest you’ll pay on this particular loan. 6Now, switch the scenario. Enter a monthly payment of $200 per month for four years, and 8 percent interest. The calculated amount you can borrow is $8,192.38.